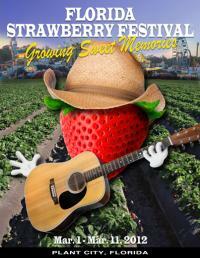 Hi Tampa Bay, Alex here to let you know about all of the fun things for children taking place at The Florida Strawberry Festival. At this year’s festival there are tons of things for kids to do, besides enjoy the beautiful outdoors and eat tons of strawberries. Some of the wonderful activities for children are listed below. Baby Contest: This contest is taking place on Sunday, March 4 from 3:45- 4:45 p. m. There will be two contests and one diaper derby. You may enter your child in a maximum of one category in each contest. Children participating must be between 6- 18 months. Kids Show- Kandu and Jill The Magic Lady: Kandu and Jill The Music Lady created a show like no other, which incorporates live music, sound effects, sight gags, slapstick comedy and audience participation. This show captivates both the young and the young at heart. Kiddie Rides:This expanded kids section has bumper cars, swings and a couple other fun rides for children. Find out more information on the activities for children taking place at The Florida State Fair, by clicking here. A great day to make a trip out to the festival with your children is this Saturday. Kids Free Day is taking place at The Florida Strawberry Festival this Saturday; kids through high school will get in free. Just stop by any festival ticket booth and receive a complimentary entry ticket on this special day. There is also a FREE kids concert on the Wish Farms Soundstage. Suite Caroline, sponsored by Fantastic Sams, the talented singer/songwriter, will take the stage at 1 p.m. I hope you all enjoy the festival and the wonderful food, rides and concerts taking place!